Love your photos, the dragon is great! Great pictures! Love those glass flowers. looking forward to seeing them. 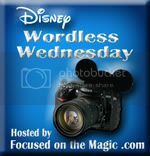 Thanks for sharing and for joining in the Disney WW Blog Hop fun! Those glass flowers are so cool. Can't wait to see them in person! Those glass flowers are so pretty! Thanks for sharing! Those glass flowers are so neat! I love the uniqueness of that dragon topiary though. We just saw the dragon display - amazing! Love the glass flowers too!